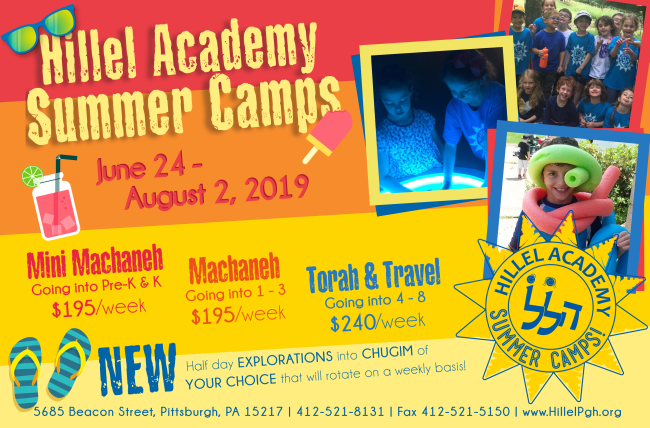 We have a tradition that says the ta'amei hamikra — musical notes — that we use to read the Torah, were given to Moshe at Har Sinai. 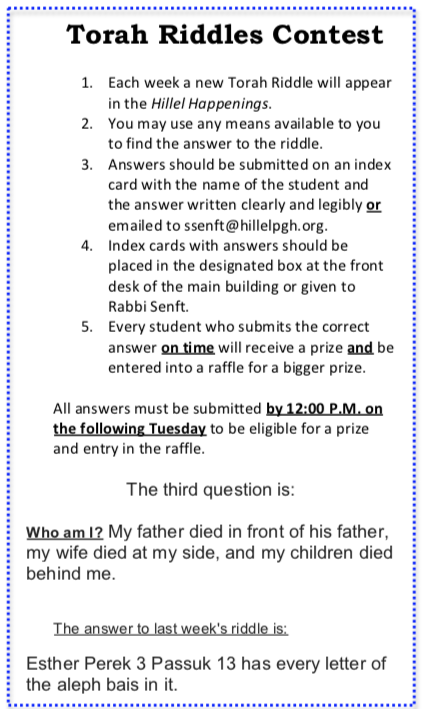 One of these notes, the shalshelet, is found only four times in the Torah, and once in this week’s parasha. 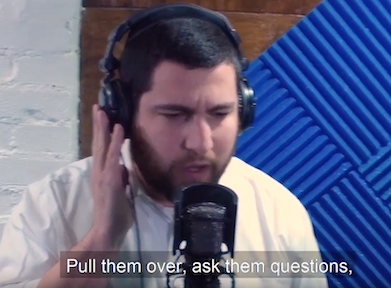 This lengthy note is often associated with struggle and tension. 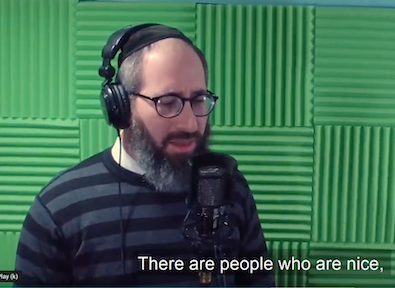 The first time this note appears is in Bereshit when the Torah describes Lot’s inner struggle as he is urged to leave S’dom. The word “and he hesitated” is read with a shalshelet, drawing out the word as much as possible. Rashi explains that the thought of leaving behind material wealth gave Lot great pause and he had to be forcibly pulled away from his house. 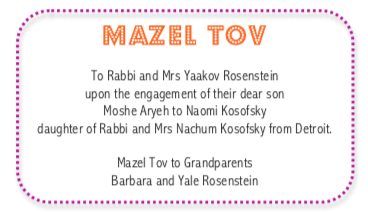 The shalshelet next appears in the prayer offered by Eliezer when he pleads with Hashem for clarity and direction as he chooses a wife for Yitzchak. Here, Eliezer is charged with finding a wife for Yitzchak from the family of Avraham. However, having imbibed the practices and thoughts of Avraham Avinu for a lifetime, Eliezer would have loved Yitzchak for a son-in-law. His prayer was that of the person who knew with his mind what he should say, but felt something different in his heart. Yosef’s refusal to comply with the advances of Potifar’s wife are marked with the third shalshelet. 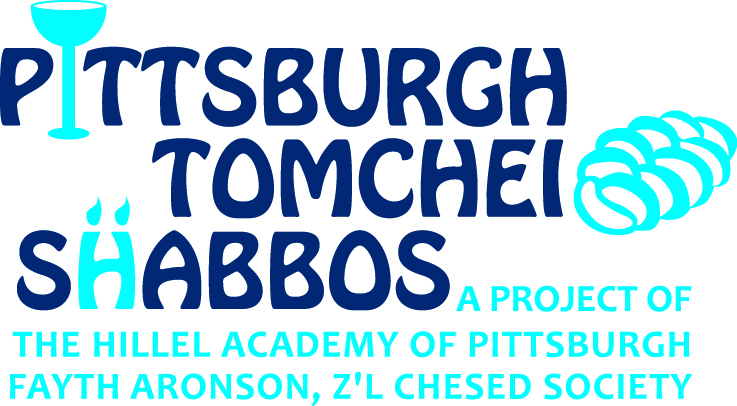 Here too, chazal understands that a struggle took place in the heart of Yosef. 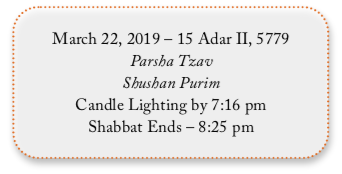 Rabbi Yaakov Neuberger of Yeshiva University points out that the shalshelet of Parashat Tzav also represents an internal struggle. The shalshelet appears as Moshe prepares the ram that will complete the inaugural service of the Mishkan. 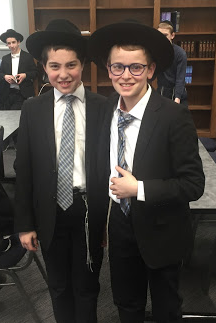 After this korban, Aharon will take over and Moshe will return to the role of a Levi. It was only during those initiating seven days that Moshe was allowed to do the avoda of Aharon. 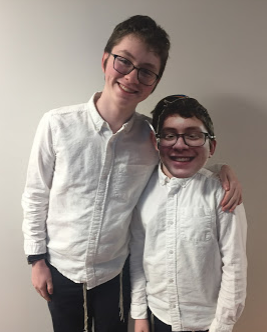 Moshe was conflicted because even though he was returning to the role of national leader, he was losing the privilege of performing the service in the hechel. 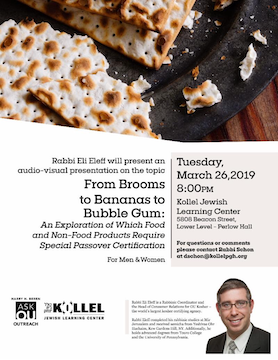 One might not think that this struggle of Moshe would be on the same magnitude as Lot leaving S’dom or Yosef’s in Egypt. 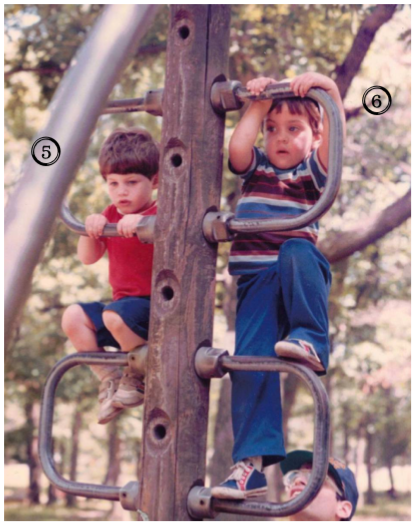 In reality, for Moshe, the struggle was on that same level. 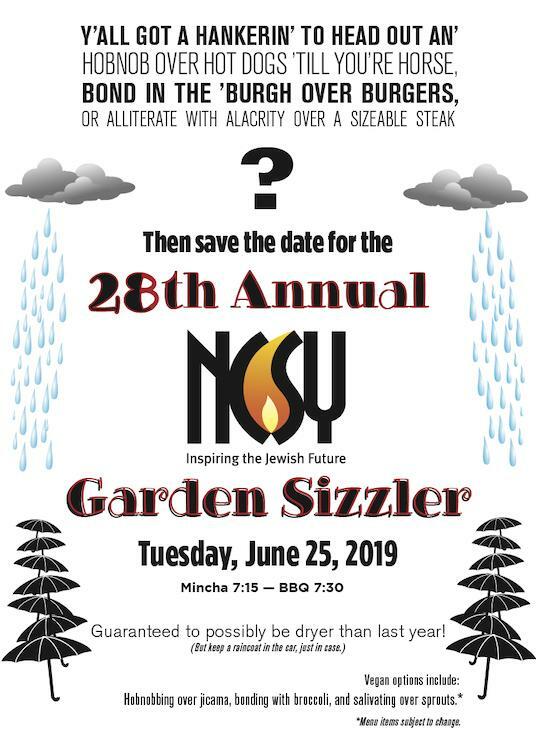 In life, we do not always have the ability to devote enough time to our Judaism relationship with Hashem. 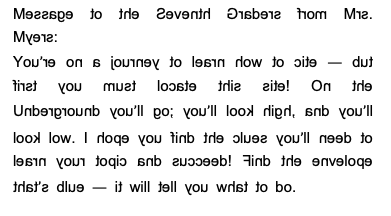 While this can be frustrating, we must find solace in the fact that Moshe Rabbenu felt this struggle himself. 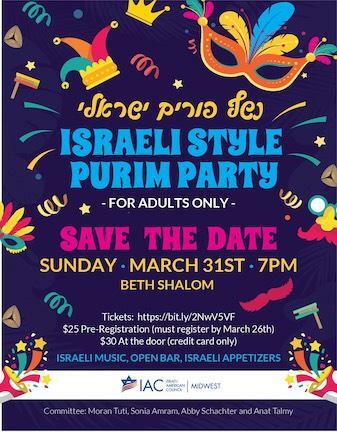 I hope everyone had a wonderful Purim and Shabbat Shalom. 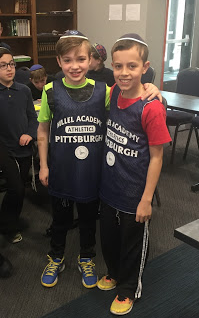 This past weekend the Hillel Academy Boys High School basketball team, the Hillel Heat, took their talents to Yeshiva University in New York City as part of a five-day weekend tournament consisting of the best Jewish teams from around the country. 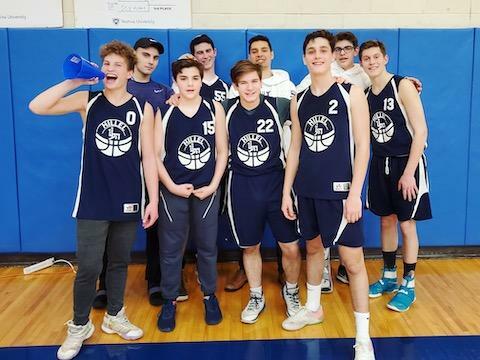 During this tournament the team went 1 - 2, defeating SCY High (Southern California Yeshiva) 53-41, a team previously ranked higher than the Heat. 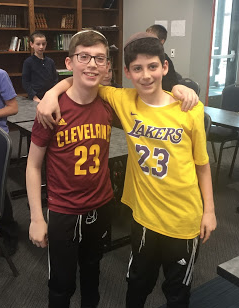 Despite star senior guard Yoshi Mahony coming down with a stomach bug, the Heat were still able to pull through with the win due to the leadership of starting point guard Aaron Kraut, who averaged 19.3 points per game, Benji Marcus, who came up clutch countless times over the weekend, and Reuven Kanal, who had 15+ rebounds in the win. 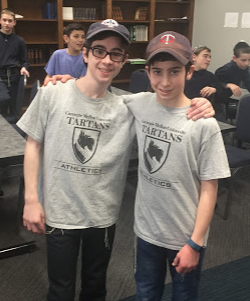 This win is rumored to be the first win in Sarachek history for Hillel Academy in almost 15 years. 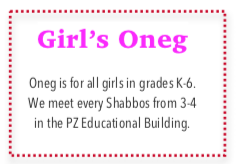 The last time the Heat were rumored to win a game in Sarachek was when they were called “Mesivta” located in White Oak. All in all, the whole Heat team agrees that the weekend was like no other and they can’t wait to return and compete again in the future. 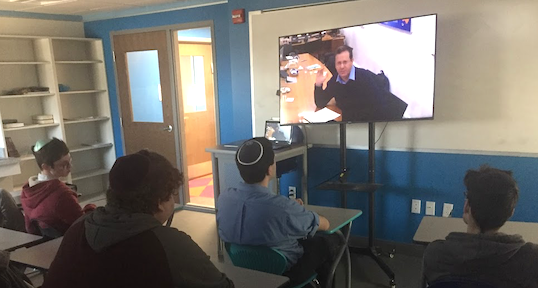 Boys High School students participated in a live webinar with former Member of Kneset and current head of Jewish Agency, Isaac Herzog. 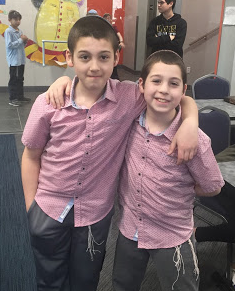 The Middle School Boys went to Cleveland for the weekend for the Midwest Siyum Mishnayos. 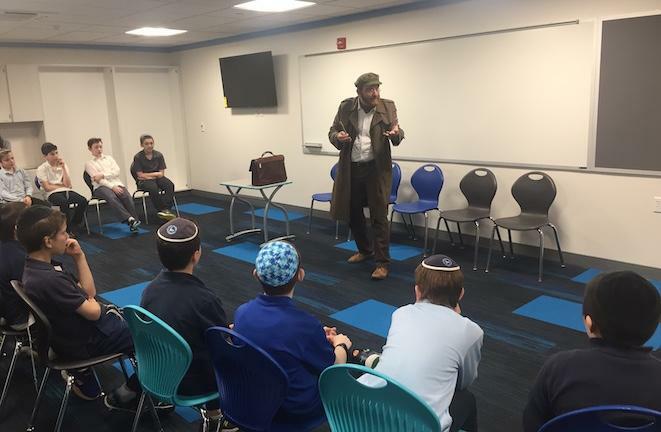 Israeli actor Amichai Pardo performed "Korczak — Ten Matchboxes," an interactive play about educator and child advocate Janusz Korchak, to the Fifth and Sixth Grade boys. 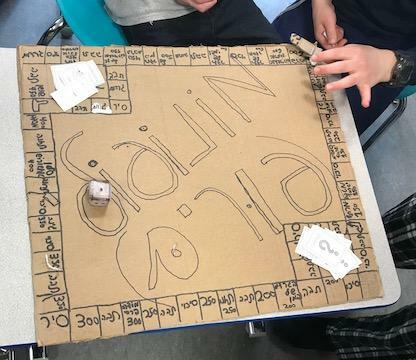 The Seventh Grade Boys put their ingenuity and scissor skills to good use by creating a literal board game! 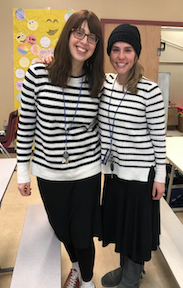 These teachers dress like this every day. You’d think they plan it in advance, but they don’t. Just total coincidence! 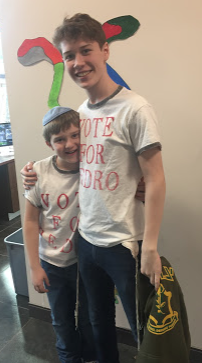 It has absolutely nothing to do with Adar dress-up days whatsoever. 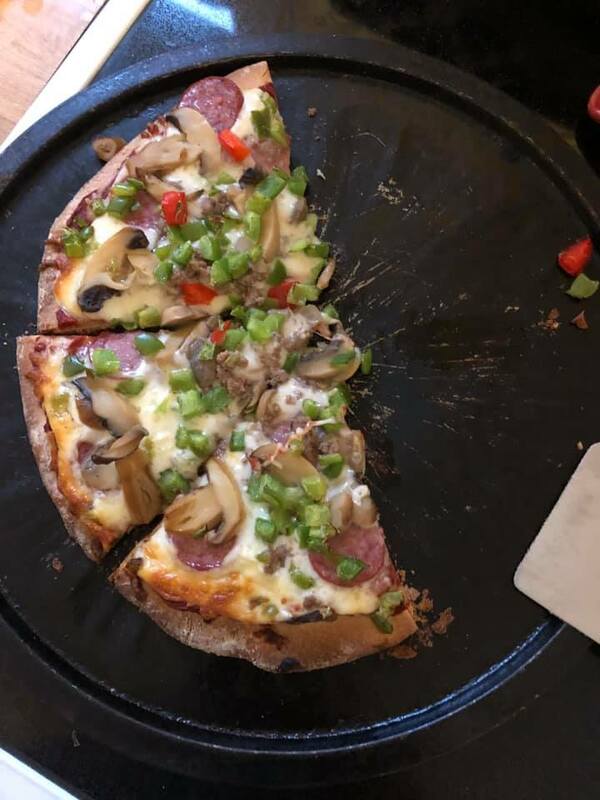 No — your eyes do not deceive you! 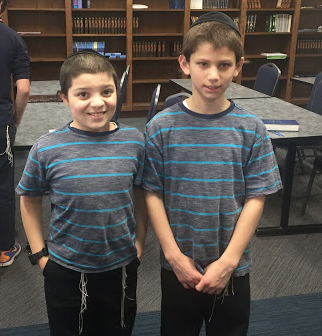 Hillel Academy has been overrun with twins! 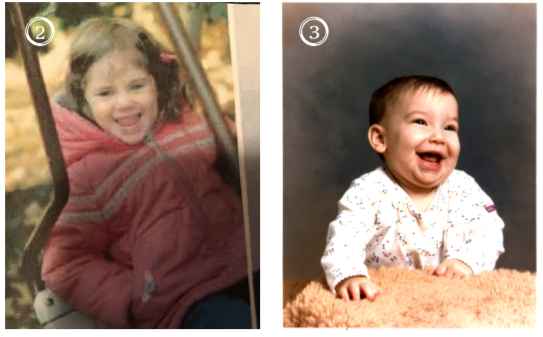 Clearly, most of our twins are fraternal, and therefore not exactly alike. 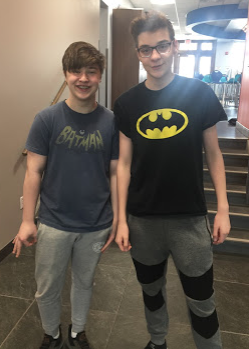 Others are definitely identical — most notably Gabe Small and Gabe Smaller, and the dedicated fans of Pedro. 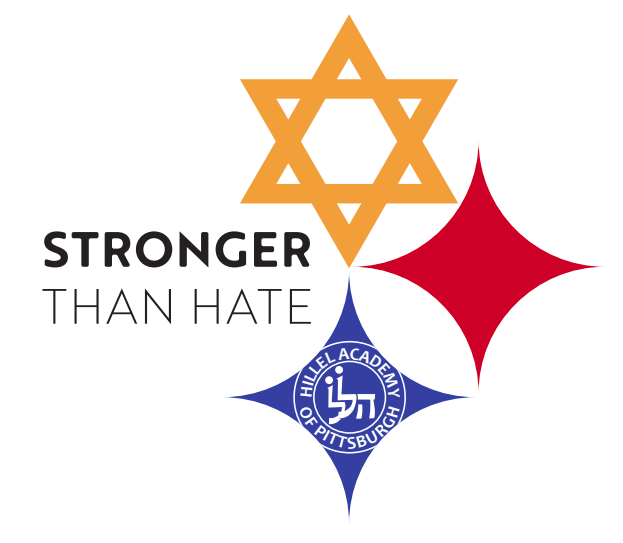 To the Kindergarteners and the Fourth Grade for winning the annual Purim Door Contest! 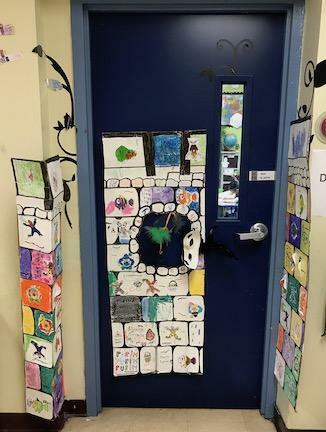 The judges would like to say that ALL the doors were amazing! 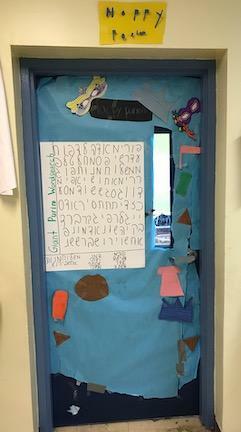 Morah Dori’s Kindergarten door was literacy based. 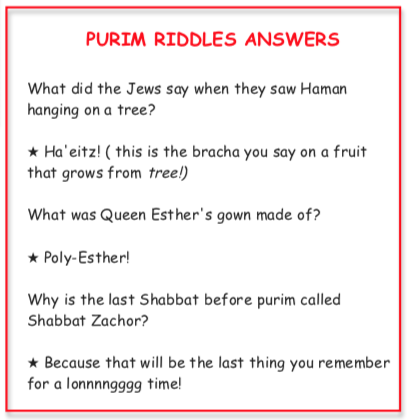 Children answered an open question what they liked best about Purim and their answers were posted. 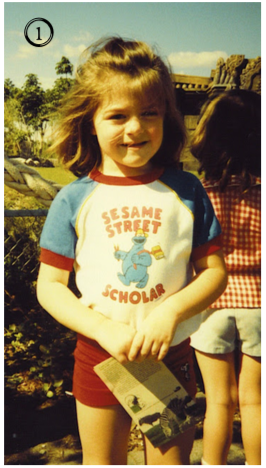 The Mylar background was simply for bling! 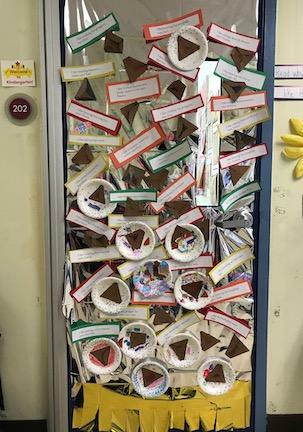 These Fourth Graders spelled “Happiness” in many languages! 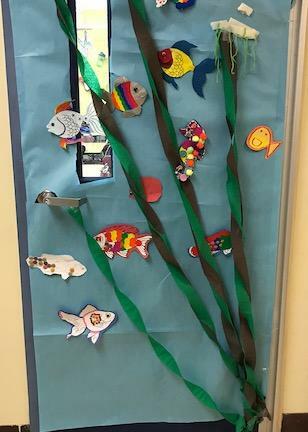 The Kindergarten doors are decorated as a Purim celebration. 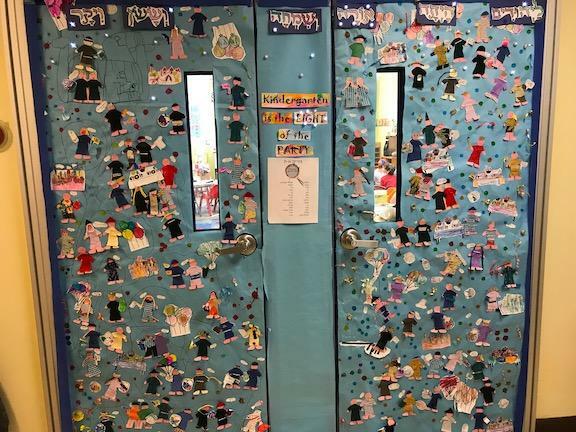 The children created over 100 Purim characters to create a huge festive party. 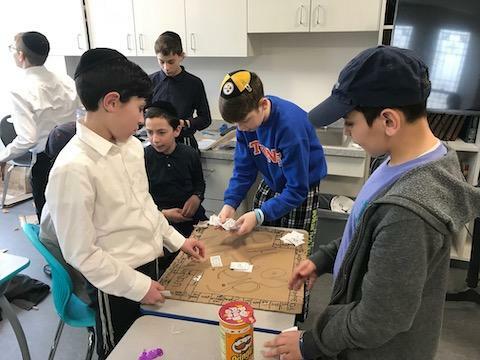 In class they learned something about Purim connected to each of the alef-bet letters. 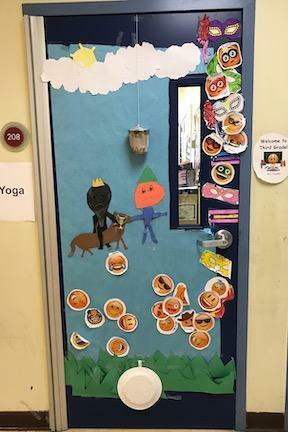 All of these things can be found somewhere on the doors. 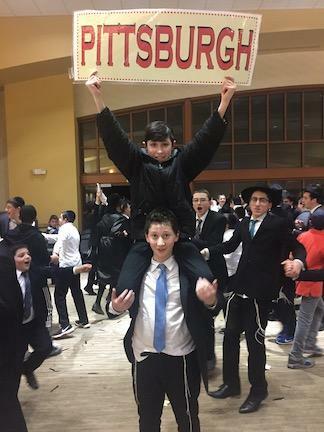 Also, when the Jews celebrated the victory over their enemies, there was great Light and Joy and Kindergarten is the Light of the Party! 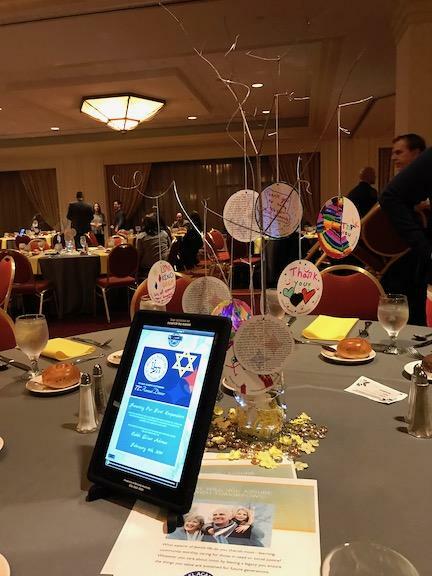 Our Purim party is complete with shining lights. 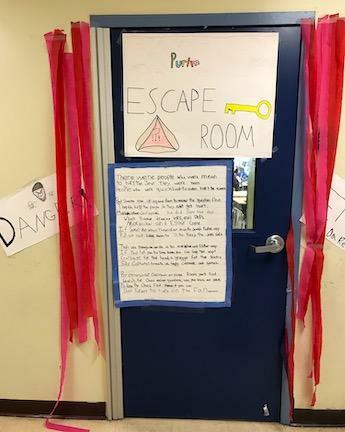 Rabbi Levy’s Fourth Grade door invited us in to an elaborate escape room that required answering Purim-related clues to unlock Haman! 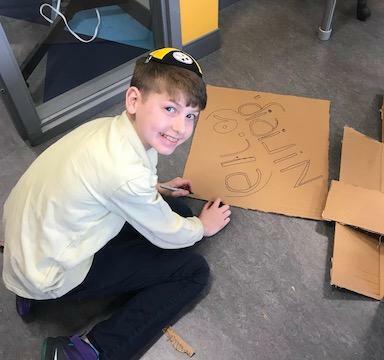 Rabbi Zuckerbrod's Third Grade class created a door with a border decorated with Megilos, Graggers, and masks, we had a giant Purim word find containing key words from the Megila and the Holiday of Purim. 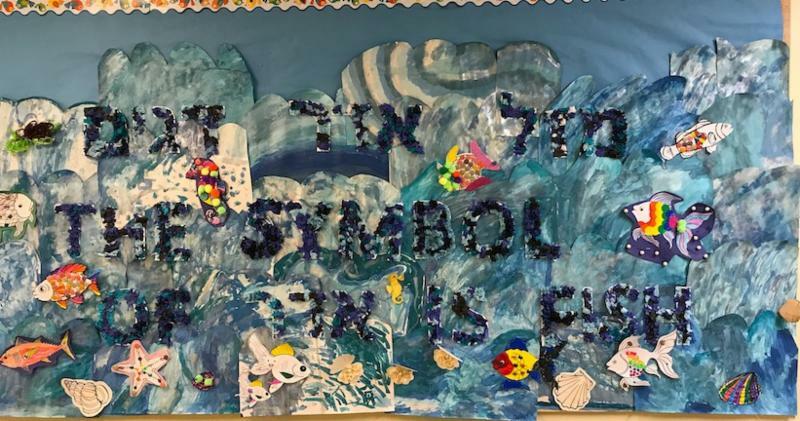 The Third Graders expressed their feelings about Purim with emojis! 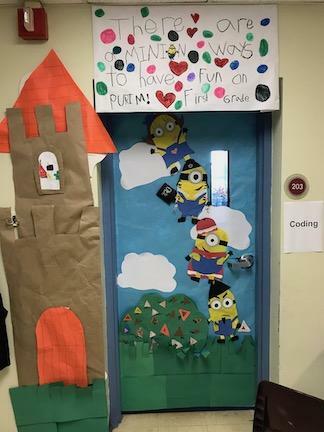 Morah Morgan’s First Graders suggested Minions as a theme for their door, and had fun with a pun! 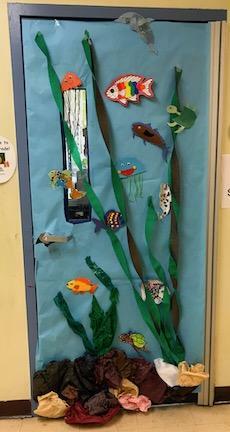 The Second Graders embraced fish as their Purim theme for their doors — and made quite a splash! 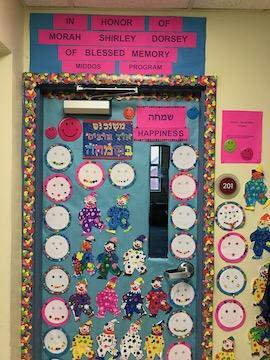 Morah Hannah’s First Grade doors are about Simcha, Happiness. 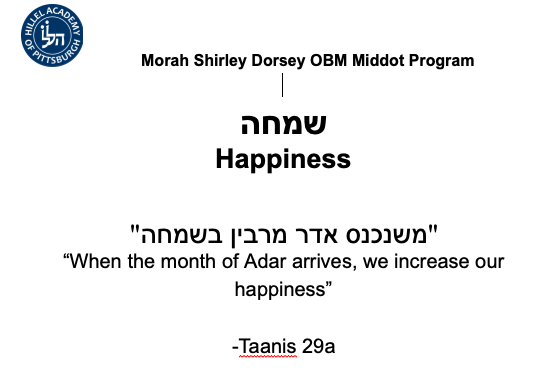 Simcha is the Middah of the month of the Morah Shirley Dorsey OBM Middos Program. 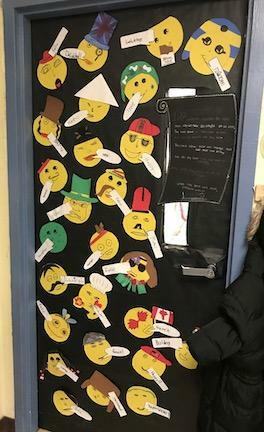 The first graders made smilies and clowns. 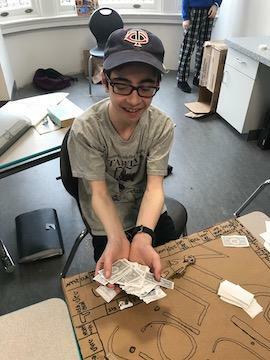 They also made fish for Mishaneichnas Adar Marbim B’Simcha. 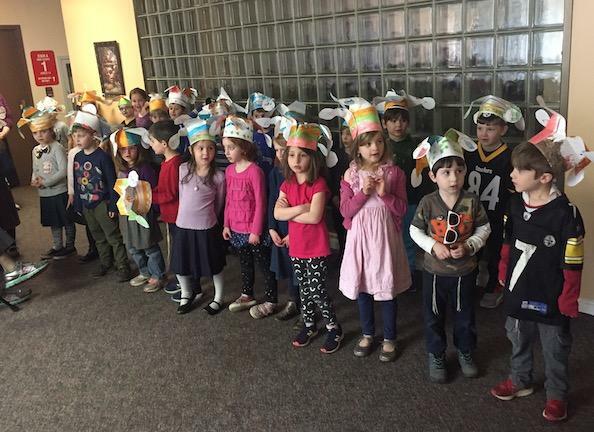 The Kindergarteners sang a Purim song at Beacon Place and brought lots of happiness to all! 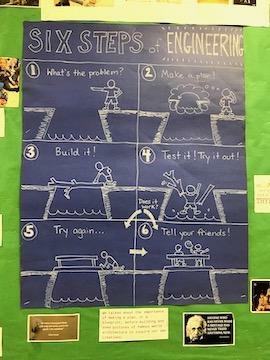 The PRE-K students are learning about the six steps of engineering, including how to evaluate a problem, design a solution, test it to see if it works, and make adjustments to get it just right! 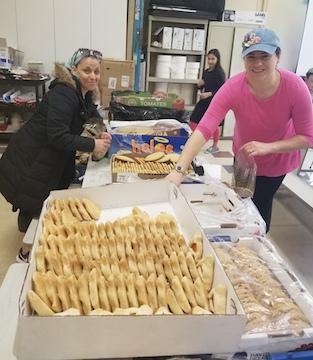 A big THANK YOU to all who helped make this year’s Purim Baskets for everyone to enjoy! 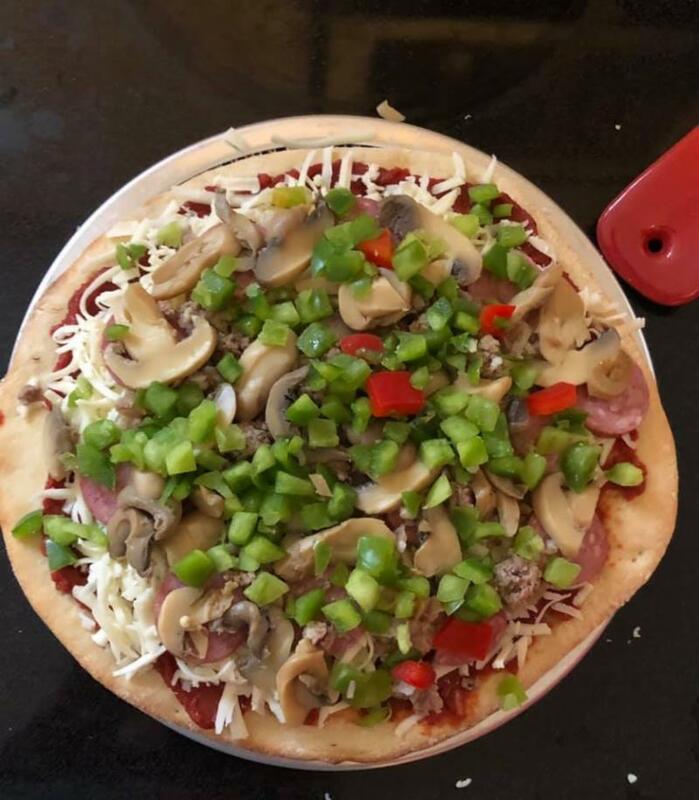 Thank you to Shabbox for the delicious pizzas, quiches, and cookies! 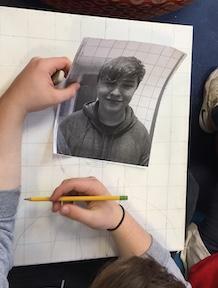 High School students work on their wacky grid portraits. Bassie Langer - I can play violin. 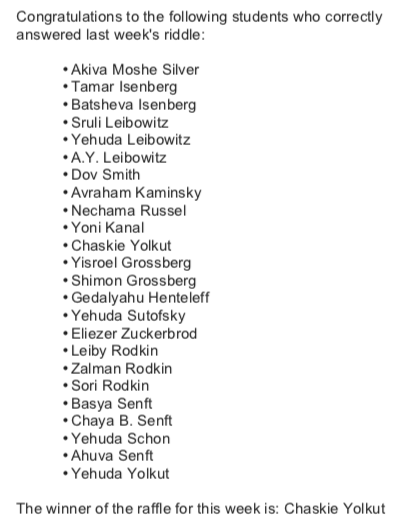 Yinon Leibovich - play football faster than them. Yael Beck - a cartwheel. Shmuel Kanal - ride a ripstik. Cob Shaw - stay up the whole night. Tali Kisilinsky - work a smartphone. Lori Ziff - round off back handspring. Nechama Russell - backwards tumblesauce. Tahara Reinhertz - standing back tuck. 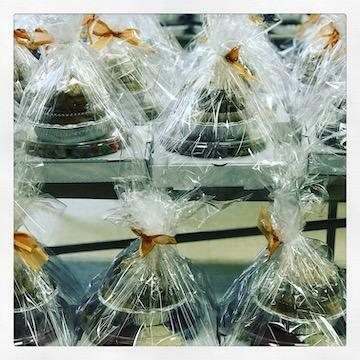 Geri Pollok - fit in a box. 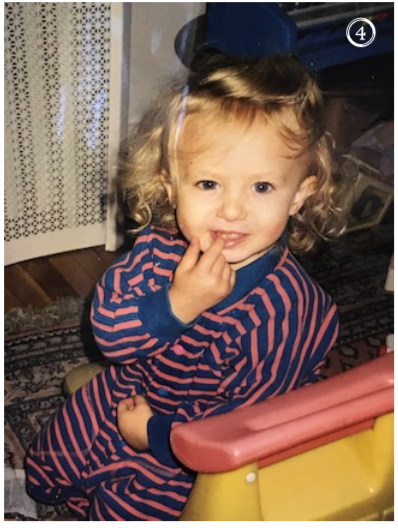 Tali Itskowitz - I can juggle! True fact. 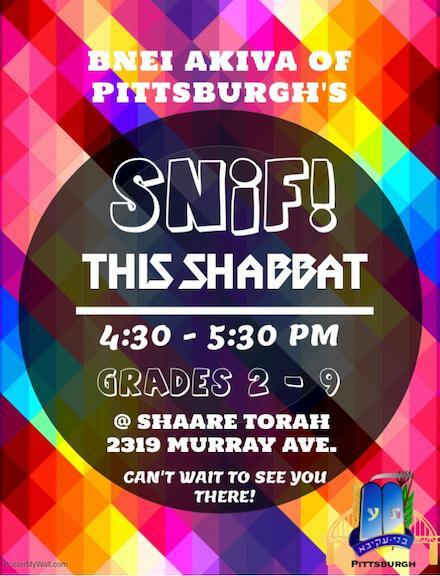 Shoshana Levari - I can do my math homework. 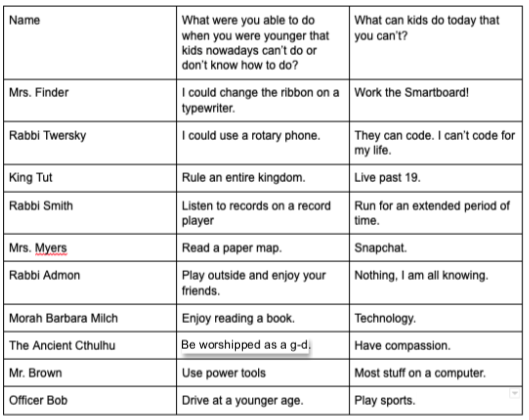 Leora Goldberg - I can use the internet. 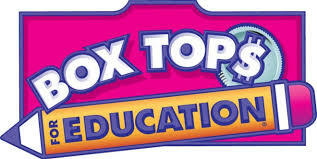 Books taken out from the library during library classes must be returned to the library during library class. 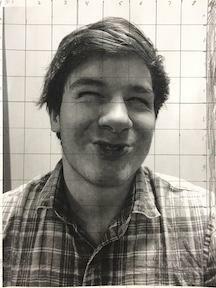 DO NOT leave books on my desk or anywhere else in the library. They are considered charged out to the borrower until returned during class. If you signed a book out from the cart in the back, returning the book to the cart and scratching your name off the list is the way to return it. 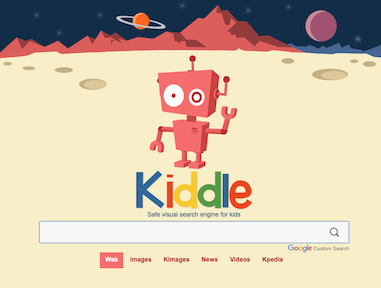 Mrs. Oz recommends kiddle.co, a Google-based kid-friendly safe internet search engine. It can be found at www.kiddle.co .